Welcome to SCtoC's coverage of the 2018 Hyundai Sun Bowl. Here, we will preview this match up between the Cardinal of Stanford and the Panthers of Pittsburgh. This will serve as the preview and game thread. Included will be scoring updates and stat summaries following each quarter, and at the end of the game. What: The Cardinal and the Panthers meet up in El Paso in the Sun Bowl. When: Monday, December 31 at 11 a.m.
Where: Sun Bowl Stadium; El Paso, Texas. 2018 Records: Cardinal 8-4 (6-3 Pac-12 North); Panthers 7-6 (6-2 ACC Coastal). 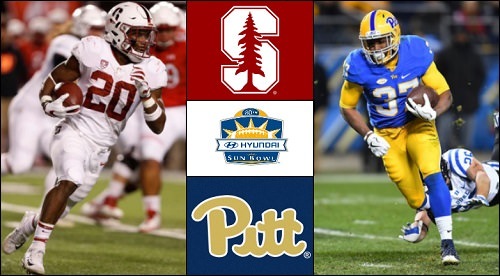 Head Coaches (overall as HC): Cardinal - David Shaw (80-26); Panthers - Pat Narduzzi (28-23). Previous: The teams have met three times, but not since 1932. The Panthers lead the series, 2-1 with a 16-7 win at Stanford in 1922 and 7-0 win at home in 1932. The Cardinal defeated the Panthers, 7-6, in the Rose Bowl at the end of the 1927 season. Cardinal Notes: This will be the collegiate swan song for Stanford seniors, giving the team the opportunity to finishs their final season 9-4 with a substantial bowl win. That includes the links of running back Bryce Love and wide receiver J.J. Arcega-Whiteside, who each have been stellar in their Cardinal careers. The Cardinal have won a pair of national championships in 1926 and 1940. They are an even 14-14-1 in bowl games, including a 39-37 loss to TCU in last year's Alamo Bowl. Their first bowl participation was in The 1901 Rose Bowl in which they fell to Michigan, 49-0. They have reached a bowl game in each of David Shaw's eight seasons as head coach of the team. The Cardinal have turned more to the pass this season, with junior K.J. Costello leading the way. Costello has completed nearly two-thirds of his passes for 3,435 yards with 29 touchdowns and 11 picks. Love, last season's Heisman Trophy runner-up, has been plagued by a leg injury much of the season, but still gained 739 yards on 166 carries with six touchdowns. Arcega-Whiteside needs just 31 receiving yards in this game to finish with a thousand-yard season. He has caught 60 passes for 969 yards with 14 touchdowns. Trenton Irwin will factor heavily in the Cardinal passing attack, as will tight ends Kaden Smith and Colby Parkinson. Panthers Notes: Pitt has a long history of post-season success. The Panthers won nine national championships since fielding their first team in 1890. They have been a fixture during bowl season and are appearing in their 10th bowl game in the past 11 seasons. They have appeared in 33 bowl games in their history, accumulating a 13-20 record in those games. Ironically, their first-ever bowl appearance was against Stanford in the Rose Bowl to end the 1927 season in which they lost to the Cardinal, 7-6. Among the notable players in Panthers history are former NFL player and head coach Mike Ditka, former quarterback Dan Marino, Heisman trophy winner and former NFL running back Tony Dorsett, and current NFL wide receiver Larry Fitzgerald. Quarterback Kenny Pickett leads the Panthers' attack. He complete just over 60 percent of his pases this season for 1,833 yards with 12 touchdowns and six interceptions. Pitt is one of just two BCS teams which feature two thousand-yard rushers. Qadree Ollison gained 1,190 yards on 189 carries with 11 touchdowns, while Darrin Hall had 1,021 yards on 137 yards with nine scores. Taysir Mack caught 21 passes for 489 yards, and Maurice Ffrench had 30 catches for 466 yards and a team-high six touchdowns. Sun Bowl Notes: This bowl game is among the older bowls in college football with the first incarnation being played in 1935. It's played in El Paso, Texas, which is just about as far west as can be in the state of Texas. 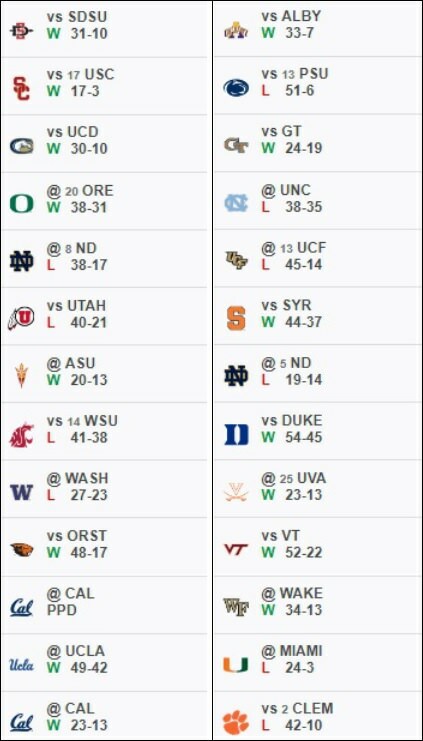 North Carolina St. defeated Arizona St. in last season's edition, 52-31. Stanford has won three of their four previous visits to the Sun Bowl. The Cardinal defeated LSU, 24-14, in 1977; shut out Michigan St., 38-0, in 1996; and clipped North Carolina, 25-23, in 2016. They lost, 21-27, to Oklahoma in 2009. The Panthers have played in three Sun Bowls, with a 2-1 record. They defeated Kansas, 33-19, in 1975; and topped Texas A&M, 31-28, in 1989. They lost to Oregon St., 3-0, in 2008. Glenn "Pop" Warner served as head coach for both teams in his coaching career. He was at Pittsburgh from 1915 to 1923, and at Stanford from 1924 to 1932. Graphic Credits: Above left: Cardinal RB Bryce Love (photo by George Frey/Getty Images). Above right: Panthers RB Qadree Ollison (photo by Joe Sargent/Getty images). We're just a few minutes before game time. This promises to be a good one. Go Stanford! No Bryce Love for Stanford; out due to injury. Stanford won the toss and will receive the opening kickoff. Ok Stanford. Let's try this again. Uhg, another three and out for Stanford. I like the pressure on Pickett on that 2nd down. We have to tackle better than this. FG Pittsburgh. Alex Kessman 29 yards. Our offense is really out of whack. They need to settle in and get some first downs. 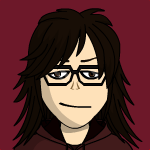 Dorian Maddox. Are we looking at the future of Stanford's running game? Touchdown Stanford. Cameron Scarlett 1 yard run. Jet Toner kick.